It took around three hours for fire officials to douse the blaze. A massive fire broke out at a central Delhi's hotel, Arpit Palace, around 4:35 am on Tuesday morning, killing at least 16 people, said fire officials. A woman and a child are also among the dead, reports said. The hotel is located near the Gurudwara road in Karol Bagh. It took around three hours for fire officials to douse the blaze, following which cooling operations were launched at 8am. Meanwhile, the local police have lodged an FIR in connection with the incident, and cops are investigating if there was any sign of negligence by the hotel's staff. The cause of the fire is yet to be ascertained but officials suspect a short circuit might be a major reason behind the incident. Prime Minister Narendra Modi has also condoled the loss of lives in a massive fire incident. In a tweet, PM Modi mentioned that he's "Deeply saddened by the loss of lives due to a fire at Karol Bagh in Delhi. I convey my condolences to the families of those who lost their lives." He wished for the speedy recovery of the injured. 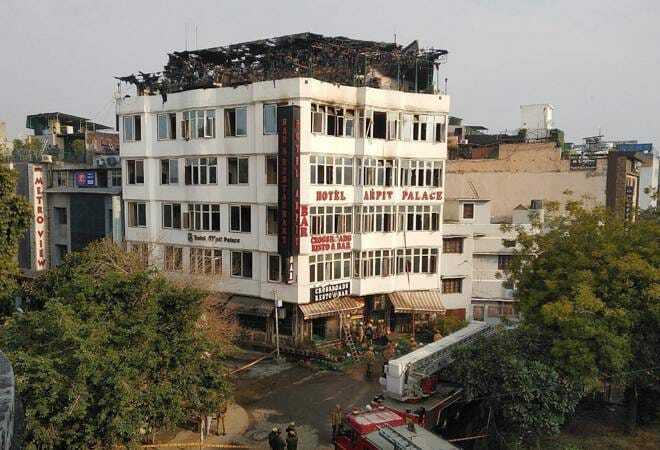 Due to the fire incident at Karol Bagh, Deputy Chief Minister Manish Sisodia has cancelled the event to mark the fourth-anniversary celebration of the Aam Admi Party (AAP) government. Vishal Dadlani, singer-composer, was also supposed to perform at the event, held at Talkatora Stadium.